Heathrow can expand and people can fly more without ruining the country's carbon targets, says the UK government's official climate watchdog. It says this means other sectors of the economy must reduce emissions by 90% to allow aviation some room to grow. But it added that the future increase in flying must be limited to 60%, not 200% as projected by the government. Environmental groups said the report was a "nail in the coffin" for government plans to expand UK airports. The Committee on Climate Change is an independent body set up under the Climate Change Act to steer government policy. It previously called for aviation to be brought into the global deal on climate being debated in Copenhagen, Denmark over the next two weeks. The report stated that improved aircraft design would allow some carbon-free expansion of aviation. High-speed rail would also allow people greater mobility as they get richer. Video-conferencing had the potential to increase sharply, too, it said. The committee said taxes would go up as aviation is taken into the EU carbon emissions trading scheme and the price of permits rose to a projected £200 per tonne by 2050. But it warned that even this would not be enough to curb our desire to fly, so other measures would be needed. 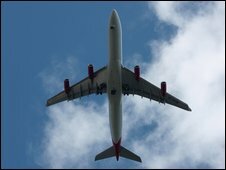 Environmental groups said the report showed that unregulated growth in the UK's aviation industry was unsustainable. Richard Dyer, Friends of the Earth's transport campaigner, called the findings a "reality check". "The government should tear up its Aviation White Paper, abandon plans to expand UK airports and develop an aviation policy that doesn't wreck the planet," he said. Jeff Gazzard from the Aviation Environment Federation said the report put pressure on airlines to improve their environmental performance. "The Committee on Climate Change has placed once-and-for all limits on aviation expansion and the onus is now firmly on the industry to deliver actual low carbon growth, not just talk about it," he added. But environmentalists will be disappointed the report has not ruled out further expansion at Heathrow. Committee members say there is over-capacity in some parts of the country and under-capacity in others. Privately, committee members admit taxes would exclude the poorest from the benefits of flying, whilst allowances would be administratively difficult and may smack of social control. Other regulations may be necessary, the committee believes. If aviation is to be allowed to grow in a restricted way, the government will have to decide where that growth should happen. In absolute numbers, the committee's calculations look like this: The aviation white paper of 2003 envisaged growth in passenger movements from two million a year currently to six million a year with rising income. The committee says allowing 60% growth, the top limit must now be 358 million. It now expects the government to factor these figures into its national aviation policy statement due next year. The question will be whether they can be allowed to fly still more.